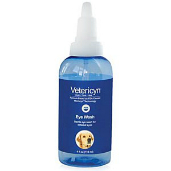 Shop for eye drops for dogs at VetDepot.com. To safeguard your dog’s eyes and vision, perform regular eye examinations, watch for indications of eye problems, and use routine procedures to protect your dog’s eyes. This not only helps prevent problems and ensures early treatment, it also helps prevent a significant risk to your dog’s eyes: self-injury. 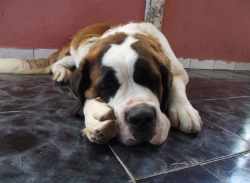 "Your dog’s eyes are susceptible to infections, injuries, disorders, and other threats." Dogs experiencing eye irritation are prone to pawing or scratching at their eyes or rubbing them against carpeting or other textured surfaces. Such attempts at relief easily cause injuries, including corneal scratches. These injuries quickly worsen without proper care, potentially causing corneal ulcers and impaired vision. Check your dog’s eyes once every week. Bring your dog to a well-lit area and look straight into her eyes. Both pupils should be the same size, the whites of the eyes should be white, there shouldn’t be clouding or discoloration, and the eyes should be free of tears, discharge, crust, and debris. Gently pull down the lower eyelids and make sure they are pink inside, not red or white. If you notice any irregularities, schedule an appointment with your veterinarian. Don’t forget, your dog should have a well check at least once per year, at which time your veterinarian examines her eyes. Your dog’s eyes are susceptible to infections, injuries, disorders, and other threats. Discharge, crusting, and tearing are common warning signs. If you notice your dog holding an eye closed, pawing or scratching at her eyes, or rubbing them against something, this indicates there is something wrong. Discoloration in or around the eyes, white or red eyelids, the appearance of a third eyelid, cloudiness, unequal pupil sizes, tear stains on fur, and other abnormalities are also causes for concern. If you suspect an eye infection or other problem, see your veterinarian as soon as possible. Your dog may need an eye antibiotic like Neomycin or other professional care. There are ways to reduce the risk of injury, irritation, and infection in your dog’s eyes. Keep facial fur trimmed away from her eyes, and wipe the corners of her eyes gently with a wet cotton ball every few days to remove gunk and dirt. Wipe outward and don’t make contact with the eyeballs. Also, perform periodic cleanings with a sterile eye solution.